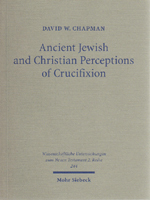 David W. Chapman examines Second Temple and early rabbinic literature and material remains in order to demonstrate the range of ancient Jewish perceptions about crucifixion. Early Christian literature is then shown to reflect awareness of, and interaction with, these Jewish perceptions. Ancient Jewish historical accounts of crucifixion are examined, magical literature is analyzed, and the proverbial use of crucifixion imagery is studied. He pays special attention to Jewish interpretations of key Old Testament texts that mention human bodily suspension in association with execution. Previous studies have demonstrated how pervasive in antiquity was the view of the cross as a terrible and shameful death. In this volume, the author provides further evidence of such views in ancient Jewish communities. More positive perceptions could also be attached to crucifixion insofar as the death could be associated with the innocent sufferer or martyr as well as with latent sacrificial images. Christian literature, proclaiming a crucified Messiah, betrays awareness of these various perceptions by seeking to reject or transform negative stereotypes, or by embracing some of these more positive associations. Thus early Christian literature on the cross exhibits, to a greater degree than is commonly recognized, a reflection upon the various Jewish perceptions of the cross in antiquity.